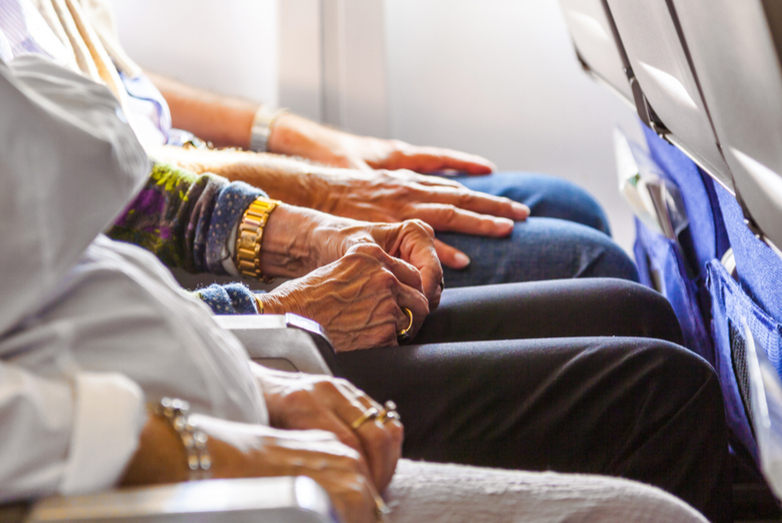 From packing light to calling your airline ahead of time, the following air travel tips for elderly passengers will make your trip smoother and less stressful. After all, travel should be enjoyable no matter your age! Do some research about the airports you are traveling in and out of, including programs they offer to help elderly or disabled passengers. Consider the parking options, as well as the shuttles that will take you to and from the parking lot to the front of the airport. Not all shuttles are wheelchair accessible, so call and ask about this if it is something you will require. In addition, call your airline ahead of time and see if you can get assistance at the door. Most airlines offer some type of assistance through security and to your designated gate. TSA PreCheck makes the security process much easier by identifying your security risk before you arrive. A five-year membership is $85. According to the TSA, 97 percent of PreCheck passengers wait in the security line for less than five minutes. While there are no discounts for seniors or disabled passengers, some credit card companies offer discounted memberships. Keep in mind, travelers that are 75 and older are allowed to keep on a light jacket and shoes during the screening process, even if they are not a part of the TSA PreCheck program. Overpacking doesn’t make you more prepared – even though it might feel that way in the moment. Plan out all of your outfits and everything else you’ll need and stick to this list. There’s no need to bring a whirlwind of extra clothes or 10 different books, chances are you’ll only read one. Pack light with the reassurance you can always buy what you need while you’re away. Light luggage makes it much easier to travel through the airport. Plus, it can make it cheaper to fly. Many airlines have weight regulations on baggage, and overhead cargo bins fill up fast. When you board the plane, let the agent at check-in know that you need an aisle chair. They can make the proper arrangements and even get you on the plane early so that you can have an aisle seat. That way, you can kick back and relax while everyone else boards the plane. This makes it easier to get up and use the bathroom, as well as get on and off the aircraft. If you have a disabled placard on your car and plan to park at the airport, call ahead and see what the rates are for disabled parking. There are often discounts you can take advantage of so don’t forget your placard on the day of. Get to the airport well ahead of your flight to give yourself plenty of time to get through security and make it to your gate. You never know when there will be unexpected delays. Also, keep in mind, planes start boarding about thirty minutes before the take-off time listed on your boarding ticket. Aim to reach the gate at least one-hour before your flight is scheduled to take off. There are usually food options, as well as stores nearby that can keep you entertained while you wait. It’s better to be super early than late. Heading to or from Melbourne, FL? Stellar Transportation is more than happy to help you get to and from the airport safely, on time, and in stylish comfort. Check out our transportation rates or contact us for a custom quote.